While they're most famous for their Original Forster Case Trimmers (invented in 1946), Forster brings an equal amount of expertise, innovation, and precision to their reloading dies. Forster Full Length Bench Rest Reloading 2-Die Sets - These sets include the innovative Forster full length sizer and Bench Rest seater dies. The full length sizer has Forster's E-Z OUT expander ball system that allows positioning of the expander for the best mechanical advantage. This elevated position combines with a Co-Ax mounting washer that corrects any misalignment of the decapper/ expander assembly and prevents the case neck from pulling off center. The Bench Rest Seater Die features an innovative, caliber-specific Die Chamber (Fig. 7). It holds the case, the bullet and the seating stem all in perfect alignment; supporting the entire outside diameter of the sized case rather than just the bullet and case neck. To further enhance alignment and accuracy potential, these dies do not crimp* (neck tension is achieved with the sizer die). Please click the images above to enlarge and view detail. *30-30 die DOES have crimping. Forster's Original Case Trimmer System and Accessories - Invented in 1946, the Forster Case Trimmer continues to be the best system for trimming cartridge case mouths. From it's I-Beam alignment system to its modern use of power screw drivers and drills to make trimming even easier, Forster has continued to innovate and advance this tool. Its really a miniature lathe. 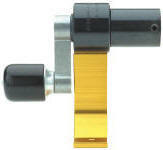 Cartridge brass is held in place and aligned by collets and fitted pilots. A multi-blade cutter then trims and squares each case mouth to exactly the same length. Once you have the trimmer, you can add neck turning, neck reaming, hollow pointing, chamfering, and other attachments. How to Choose Your Collet and Pilot - The Forster Case Trimmer tool uses collets and pilots to grip and align cartridge cases for trimming. Collets grip the case rim and pilots fit into the case mouth. There are 4 basic collets (#1, #2, #3, #4) for the Original Forster Case Trimmer and between them they fit just about every case rim in existence. Pilots are numbered like the calibers they represent: #22 is 223 caliber. #24 is 243 caliber (6mm). #26 is 264 caliber (6.5mm)... And so on. We've linked the Collet and Pilot Selection Chart (above) to show you which ones you need by cartridge name. We also have them listed Dimensionally by Collet # and Dimensionally by Pilot #. Questions? Call 800-950-9088. If you're just getting started and haven't bought your case trimmer yet, we recommend the "Kit" above as it includes 3 collets and 6 pilots and costs less than ordering them individually. To order collets and pilots individually, just click the "Info/Order" links below and select your collet(s) and pilot(s) from the menus. This handy little adaptor replaces the crank on your Forster Case Trimmer and converts it to a power trimmer with your electric screwdriver or power drill. Case Mouth Deburring... The Easy Way! Compatible with the Power Adaptor, Too! - Connect an electric screw driver or power drill and deburring gets even easier and faster. Specially ground carbide blades trim your cases to length and chamfer the inside and outside of the case mouths. Easily installs on the cutter shaft of your Forster Case Trimmer. Available in models to fit .224, .243(6mm), or .308 caliber cartidges... A very precise, satisfying tool for reloaders! If your case necks are a little too tight in the neck of your chamber, your loads will get erratic pressure spikes as you approach maximum loads. This can easily by solved by reaming the case necks with your Forster trimmer. 1st... Check Case Neck Tightness - Cases that have been fired but not yet resized should allow a bullet to slip in and out of the case mouth with just finger pressure. If you can't slip a bullet into the case neck after firing, it means the case neck didn't expand enough in the chamber to release the bullet easily. You can improve this too-tight chamber neck fit by removing the tightness in your brass with your Forster case trimmer and a neck reamer. 2nd... Replace Your Pilot with a Reamer - The Forster case trimmer pilot is simply removed and replaced with a neck reamer of the bullet diameter. 3rd... Test with One Cartridge - Center and ream the neck of one fired but not resized cartridge case. Then, full length size and decap it. Finally, see if it still has enough neck tension to seat and hold a bullet with just friction. If it does, proceed to ream the rest of your fired but not resized cases (Note: The Forster trimmer can touch up trim length at the same time if you wish). - The "Go" Gauge is used to make sure that standard factory loaded ammunition will fit reliably. Insert the Go gauge in the chamber and close the bolt. If the bolt won't close or closes with resistance, you may have the barrel screwed in too tight. Your headspace is too tight and won't fit factory loaded ammo reliably. Too Much headspace. Insert the No-Go gauge in the chamber and close the bolt. If the bolt closes easily, your barrel isn't screwed in tight enough. You have too much headspace. If the bolt closes fine, but with some resistance, your headspace is just barely acceptable*. - Ideal Headspace is when the bolt will close on the GO gauge but will not close on the NO-GO gauge. You might as well get it perfect if you're installing the barrel yourself. (for a broader understanding read "Special Circumstances" below). - Special Circumstance #1 - When headspace gauges are not available, full length sized, not yet loaded cartridge brass is sometimes used to custom fit the headspace by trial and error. Re-barrels done this way may fit your handloads fine but may not fit factory loaded ammo. - Special Circumstance #2 - A rifle with *barely acceptable headspace may be perfectly manageable by reloading ammunition with brass that is custom fit by partial full length resizing or neck sizing. For example, if you're using headspace gauges to check a factory barreled rifle, and the bolt closes with slight resistance on the No-Go gauge, it is not necessarily excessive headspace... Just more headspace than would be considered ideal. (There's actually a third "Field" headspace gauge that's the definitive No-Go headspace indicator. We don't sell the Field gauge). - Special Circumstance #3 - TC Encore and Contender barrels can give a false reading with Go and No-Go gauges if you don't understand the locking mechanism that draws the barrel down into full battery. The spring loaded locking bolt engages the frame and can latch the action closed well before it extends completely... Giving the impression it closed on a headspace gauge when in fact it didn't. - 223 Remington gauges work on .223 Rem and 6x45. - 243 - 308 Family gauges work on .243 Win, 260 Rem, 7-08 Rem, 308 Win, and 358 Win. - 6.5x55 Swede gauges work on the 6.5 x 55 Swedish Mauser. - 280 Remington gauges work on the 280 Remington. - 284 Family gauges work on 284 Winchester, 22-284, 6-284, 25-284, 6.5-284 Norma, 270-284, 30-284, and 35-284. - 30-06 Family gauges work on 25-06, 6.5-06, 270 Win, 30-06, 8-06, 338-06, and 35 Whelen.